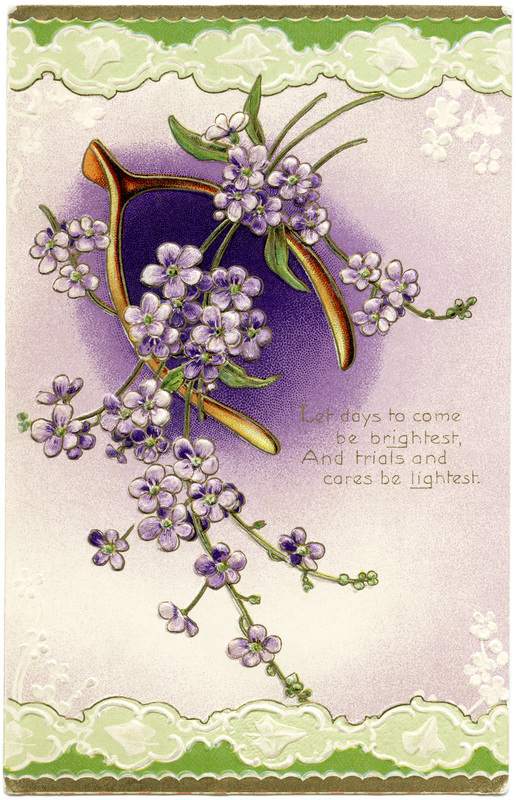 The wishbone on this vintage postcard is decorated with pretty purple flowers. The top and bottom of the card is edged with a green and white ornamental design. The faded message on the postcard is: Let days to come be brightest, And trials and cares be lightest. Click on image to enlarge. You’re welcome Diane. I’m glad you like it. I like this one a lot. I can think of many things to use it for. Thanks for sharing! You’re welcome Su. It’s great to know that you’ll be able to use it. Beautiful, I am learning to sketch at the moment and can certainly draw inspiration from this design, thankyou for sharing. I think it’s wonderful that you are learning to sketch! You’re welcome for the image, glad you’ll be able to use it for inspiration.